Time for another installment in a series spotlighting great DIY in the epic battle against ugly toys - good design the whole family can love! 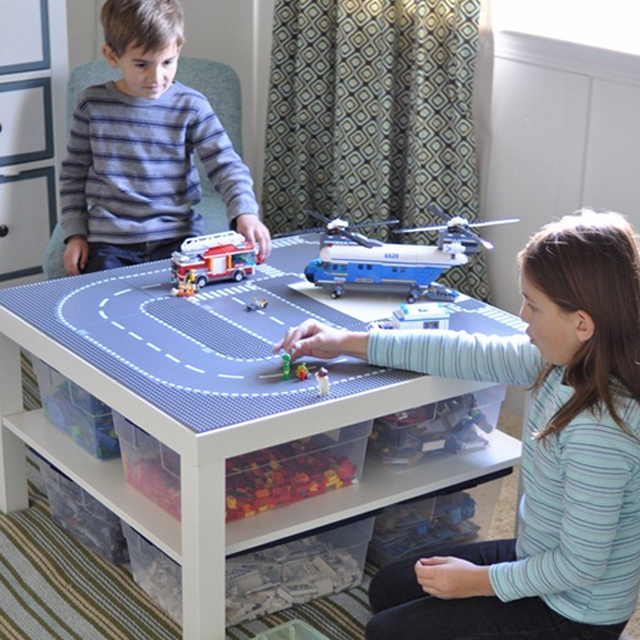 This week's DIY is from the ever amazing Kate of Centsational Girl who took this inexpensive Ikea lack table and made something any lego obsessed kid would love while keeping all those tiny little pieces organized. Anyone who has ever stepped on a orphaned lego barefoot knows the struggle is real! Feel free to send fruit baskets directly to Kate. Stop over to Centsational Girl to get all the details on how to create one of your own. Want more inspiration? Check back every Thursday for a new installment or pop over to last week's DIY Marble Toss by Pretty Handy Girl. I've had Kate's project bookmarked for years. The Legos around here are unruly and always find a way to get underfoot.